Using Dynamic Eye’s point-specific glare shielding sunglasses is an amazing experience. You can do what you need to do, look where you need to look, and see what you need to see. You no longer need to squint or tense up when you face the sun, or use the sunshade when driving. Instead of shifting to get your eyes in the shadow of your rearview mirror, you drive comfortably, confident that your sunglasses will protect you from the sun no matter where it appears. That said, it is rather difficult to convey the experience of seeing with Dynamic Eye glare shield sunglasses online. 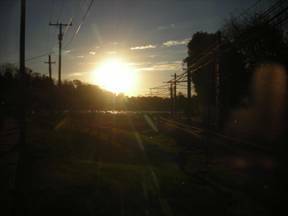 Pictures of scenes with the sun glaring in the background can be taken with or without the sunglasses, but they suffer from the limitations of both the camera and the computer screen. Neither device has anywhere close to the dynamic range of response that the human eye has. In other words, a camera cannot record, nor can the computer screen portray, the brightness of the sun, or even oncoming headlights. The human visual system, on the other hand, does respond differently to different light levels. If the light is bright enough, we involuntarily start to squint in response. It can even cause us pain. In addition, the light can scatter from the stuff in our eyes and wash out everything else we are trying to look at. All these effects are greatly reduced by point glare shielding, since 90% or more of the glaring light never reaches your eyeball. The pictures above are unmodified photographs of a glare scene through a functioning prototype with glare-shielding turned off (top) and (bottom). Like your eye, the camera reduces its sensitivity with the full force of the sun, so it can’t see as much as when the sun is shielded. 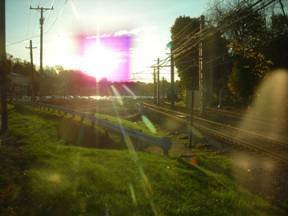 The shielded region is the fuzzy purple surrounding the sun in the right hand photograph. The edges are fuzzy because the camera is focused beyond the shielding spot, just as your eyes are when wearing them. You can also see that in spite of blocking a region around the sun, the darkened region is a small portion of the total field of view. The human eye has an even wider field of view than this camera, so the relative size of the dimmed portion is even smaller.